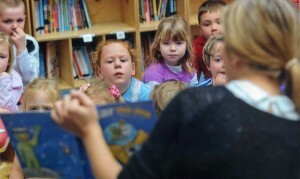 Danielle Le Brun is the author and illustrator of the first book to be granted use of the Genuine Jersey mark. She produces children's picture books and a range of other products, all with her distinctive style of drawing. Danielle has kindly told us a bit more about herself and her love of drawing. 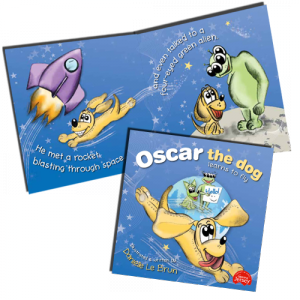 I’m a local artist producing sketches of cute cartoon characters which include cheeky monkeys, happy hippos, silly giraffes and an adventurous yellow dog called Oscar who was the star of my first children’s book titled Oscar the Dog Learns to Fly. As well as producing fun children’s stories from my illustrations; I also create personalised placemats and children’s t-shirts (a new range which will be available for purchase soon). All of my products are bright, fun and colourful. My personalised placemats are my most popular products. 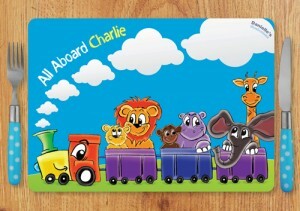 I have a range of six different designs featuring princesses, dinosaurs, choo-choo trains and mermaids and each placemat can be customised with a child’s name and a variety of options, including hair and skin colour to create the design you want. All of my placemats are 100% hand-made (in my kitchen) and are created from thick foamboard – guaranteed to protect your table from sharp knives and forks as well as liven up meal-time! 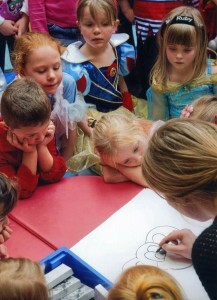 I am also holding a series of Creative Workshops for children. My first class was on the 1st June and went very well – I couldn’t get over how talented the children were, especially for so young! I will be running further classes over the summer holidays for children between the ages of 5-10 years and 11-14 years. Each workshop will cover different topics and the sessions are a fantastic opportunity for children to experiment with a variety of drawing mediums and be encouraged to draw plenty of fun animals and characters. 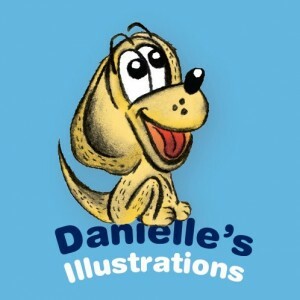 A list of my summer holiday classes is available on my website: www.daniellesillustrations.com. I have loved to draw ever since I was very young. It is quite funny really because the things that I used to draw when I was younger (cartoon animals and people) is very similar to my style of work today. From drawing at a young age, I continued to take art throughout my school years and then also at university where I undertook an Art Foundation year at Wimbledon School of Art, followed by another three years at Buckinghamshire Chilterns University studying Graphic Design and Advertising (specialising in illustration). As corny as this may sound, my love of what I am doing is my inspiration. I am very passionate about my work and I think that is the main drive behind ‘Danielle’s Illustrations’. I am currently running ‘Danielle’s Illustrations’ as a weekend and evening business as I have a full-time job during the day; I would love to work on my illustrations full-time but the business needs to grow a little more first. Therefore, when I work on ‘Danielle’s Illustrations’ I usually try and do a million things at once; so a typical evening or weekend for me would involve drawing new characters with my charcoals, updating my website to keep it current and experimenting and creating new products. All of Danielle's products can be purchased from her website: www.daniellesillustrations.com and delivery is completely free on all orders. You will also find her at St George’s Summer Fete which is taking place in the school grounds on the 22nd June. Danielle also says "I am bound to be popping up at other events throughout the rest of the year but these will be posted on my website nearer the time." You can also keep up with Danielle by Liking her Facebook Page.